Stepping stones, paving stones, Rolling Stones, crushed stone, building stone, gemstones, birthstone, healing stones, tombstone, millstone, whetstone, precious stones, kidney stones, gravestones, beach stones, massage stones, landscape stones, Stone Mountain, keystone, cornerstone, touchstone, grinding stone, sacred stones, headstone, Rune Stones. There is Stone Age, stone-broke, stonecutter, stone ground, stone fruit, Stonehenge, stonemason, stone soup. And there are several expressions: stone in one’s shoe, stone’s throw, sticks and stones, stone the crows, shouldn’t throw stones. Stones, is seems, are all around us. And they are scattered through these poems, too. 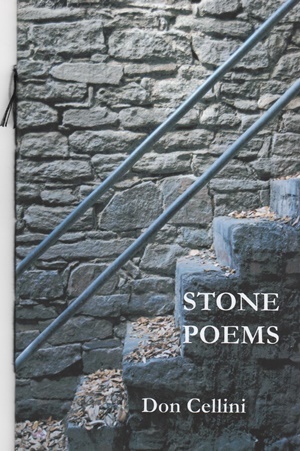 Sometimes a stone is simply that – a stone. Other times a stone may be a metaphor for something else. Don Cellini is a teacher and translator, a poet and photographer – the first two by training, the last two by good fortune. He is the author of four collections of poetry: Approximations / Aproximaciones and Inkblots, both collections of bilingual poetry; Translate into English and Candidates for Sainthood and Other Sinners/ Aprendices de santo y otros pecadores both from Mayapple Press. He has translated three books of poetry by Mexican poets including: Elías Nandino Selected Poems in English and Spanish (McFarland), Roxana Elvridge-Thomas’ Imágenes para una anunciación / Images for an annunciation (Foothills Publishing) and No recuerdo el amor sino el deseo / Desire I remember but love, no by Sergio Téllez-Pon (Floricanto Press). Cellini is also the translator of El silencio de las horas / The Silence of the Hours(Mayapple Press) by Venezuelan poet Amanda Reverón. He is the translation editor for The Ofi Press Magazine published in Mexico City. Cellini is the recipient of fellowships from the National Endowment for the Humanities and the King Juan Carlos Foundation. He is professor emeritus at Adrian College in Michigan and divides his time between Toledo, Ohio and Savannah, Georgia.